Thus, the seed of inspiration was sowed hundreds of years ago. Imagine Wedgwood’s Wonderlust collection as the flowering of that wandering spirit which was the hallmark of an epoch of cultural and artistic appreciation. This new collection is a concerted effort by Wedgwood, a British heritage brand specialising in tableware to emphasize the experiential aspect of its business by launching bespoke tea blends in tandem with establishing tea houses that were inspired by conservatories in the 18th century. The design motifs from Wonderlust are reworked pattern designs from Wedgwood’s archives; which records revealed was inspired by the Grand Tour of 17th to 18th centuries where young Europeans of means embarked on a trip around Europe and in rare cases, further abroad, on an educational rite of passage. 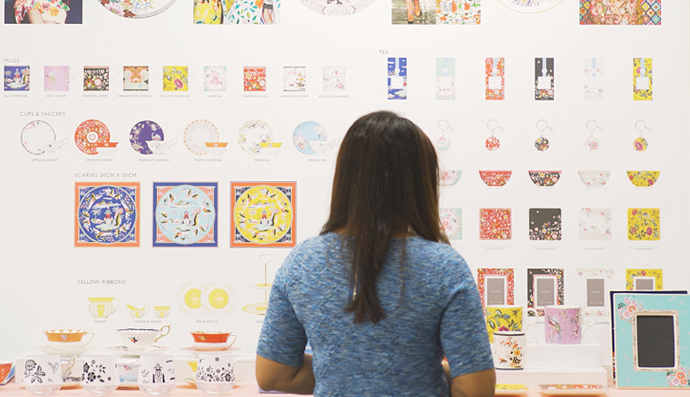 With that as a departure point, Bernadine Tay, Wedgwood’s new tea curator, got to work in translating the history and inspiration behind these design motifs into tea blends that evoke stories, places and experiences. Each tea blend aims to capture a moment in place and transports you with each sip of the tea. Bernadine at the design studio of Wedgwood. In a standard Grand Tour itinerary, a British tourist would begin his journey at home ground, Dover typically. Thus, Crimson Jewel blend is a celebration of the best British gardens has to offer with apple, raspberry, strawberry and other herbs. Crossing the channel, one would travel up the Seine to Paris. Rococo Flowers blend is a tribute to the insouciant energy that permeates the city with a light bodied white tea with floral aromas. From Paris, one would endure a difficult crossing over the Alps into Northern Italy after spending some time in Switzerland. In the cities of Italy, the masterpieces of painting, sculpture and architecture is a cultural grand set piece of their journey. Naturally, Camellia blend is gentle and balanced in flavour that reflects the aesthetics of these classical antiquities. Those who were more intrepid and adventurous, the mysterious orient beckons perhaps. Blue Pagoda blend is designed to capture this beguiling essence with medium bodied oolong tea that trails off with scent of flowers. A swan song to a long journey, Yellow Tonquin is a caffeine-free blend inspired by the autumn colours of China. It’s a wellness tea that helps to recharge the body with herbaceous mint layered with honeyed citrus notes for a sweet goodbye. Bernadine’s inspiration and sketch for Wedgwood’s Wonderlust collection – Oriental Jewel blend. Bernadine’s inspiration and sketch for Wedgwood’s Wonderlust collection – Yellow Tonquin blend. These inspirations came steadily to Bernadine. Taking in the colours and design of the motif, she expressed her thoughts on mood boards and translate them into tea leaves and ingredients. For example, to convey a sense of walking in a pine forest in the Oriental Jewel blend, a combination of black tea, sandalwood, juniper berries and rose petals were blended. This is certainly not commonly found in your average cup of tea and is what makes the collection and experience of it so unique. “You cannot be innovative and interesting without being risky,” says Bernadine. This striking ethic is what paves the way for a bespoke and original tea range that segue nicely to Wedgwood’s innovative spirit as well as the concept behind Wonderlust collection. Click to see more of Wedgwood’s Wonderlust collection.